LaVon Griffieon, of rural Ankeny, talks with her son Nick Griffieon while he downloads their crop information from the combine yield monitor on Nov. 7, 2018. Housing developments in nearby Ankeny are getting closer to the Griffieon family farm. Urban expansion, at least in the few areas where Iowa cities are growing, is eating up some of the state’s best farmland. 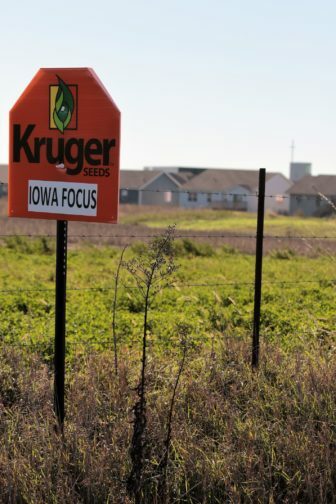 In Ankeny, a central Iowa suburb of Des Moines that a May U.S. Census Bureau report ranked as the nation’s fourth fastest-growing large city from July 2016 to July 2017, much of the land being developed for housing is high quality soil for raising crops, an Iowa State University agronomy department survey shows. Other growing communities in Iowa taking up former farmland include Clive and Urbandale in the Des Moines area and Robins, Tiffin and North Liberty in the Cedar Rapids-Iowa City corridor. Most of the land included in Ankeny’s 2030 comprehensive plan scores in the high 70s or greater for Iowa State’s corn suitability rating, which is a measure from 5 to 100 of how well-suited soil is for corn production. But as Ankeny has grown in population, from 18,482 in 1990 to an estimated 62,416 in 2017, its borders have expanded. But city leaders feel they have nowhere else to grow at a time when people want to live in Ankeny. “One of the unfortunate things is Ankeny is completely surrounded by agriculture, so the only place we really have to grow is into agricultural land,” Ankeny Mayor Gary Lorenz said. The Griffieon family has been farming near Ankeny for more than a century, since 1902. They are among the last holdouts along Ankeny’s northern border; their land directly abuts a new housing development, which one of the Griffieons’ daughters moved into in February. Farmland near Ankeny, Iowa, on Oct. 16, 2018. 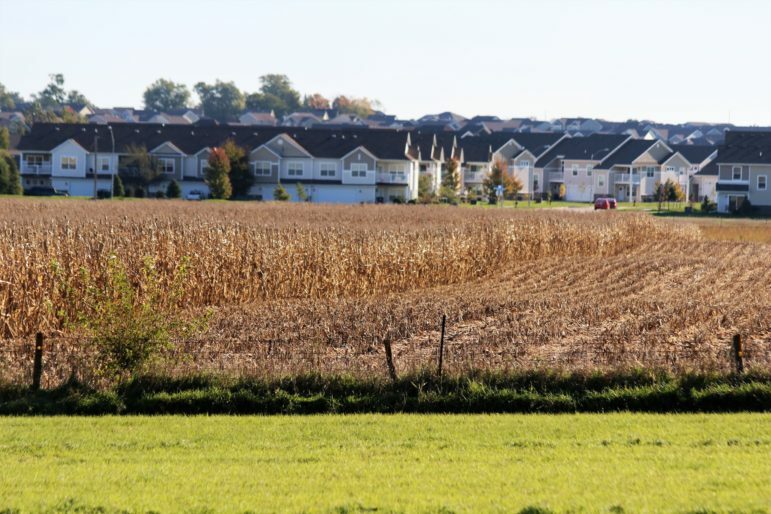 Minimal land has been rezoned from agricultural to residential since 2006 in the unincorporated areas of Polk County, Bret VandeLune, Polk County Public Works planning and development manager, wrote in an email to IowaWatch. “Unincorporated Polk County has remained consistent with our adopted comprehensive plan and corresponding zoning map. We have been successful in not recommending approval on many requests, or even discouraging would-be applicants from trying to rezone their properties,” VandeLune wrote. But that is not true in the county’s incorporated areas where county land use authorities can’t exercise control. Records on the Polk County assessor’s website reveal several hundred acres of farmland to the north and northwest of Ankeny’s border have been annexed into the city and converted from agricultural to residential zoning in the last 20 years, largely on land with a corn suitability rating in the 80s or 90s. Some areas adjacent to Ankeny have allowed residential development, VandeLune wrote. But, “these areas are predominantly between the city limits of Ankeny and Saylorville Lake, and historically had development in and around the areas already developed, so the plan and objective was to see these areas continue to develop and fill in,” he wrote. Iowa Code chapter 352 required every county in the state to establish a land use and preservation committee in 1984. The law also made each committee responsible for conducting a county land inventory and creating a land use plan. However, Iowa code does not require cities to make any such consideration for farmland. Polk County’s process for rezoning requests for unincorporated areas and amendments to its comprehensive land use plan includes meeting with property owners and groups who request a meeting, and holding public hearings on the matter. “Polk County representatives also meet annually with the Polk County Farm Bureau board to discuss a wide variety of topics, including land use,” VandeLune said. The Sustainable Iowa Land Trust, a statewide non-profit group that partners with farmers to protect farmland and promote sustainable production practices, helps seek conservation easements on farmland, Joseph Klingelhutz, a farm specialist with the group, said. The conservation easement cuts the value of the land in half by placing restrictions on how the land can be used and farmed. The goal is to promote sustainable farming practices. But Griffieon said the trust, known by its acronym, SILT, and the conservation easement don’t hold the solution to her family’s problem. The Griffieons farm about 1,000 acres, 800 of which is owned by their family. They raise and direct-market antibiotic free, no-hormone-added beef, pork, chicken, turkey and lamb, in addition to growing corn, soybeans, oats and alfalfa. It can take a farm that large and diverse generations to implement sustainable practices like no-till or crop rotation that prevent soil erosion and promote water quality. After putting away supplies, LaVon Griffieon heads to another side of the family’s farming operation. Other than the conservation easement, few protections exist for Iowa farmland. “In a dream situation somebody would come in and buy my development rights, which they do in other states but they don’t do in Iowa. They don’t protect farmland in Iowa because there’s too much of it,” Griffieon said. 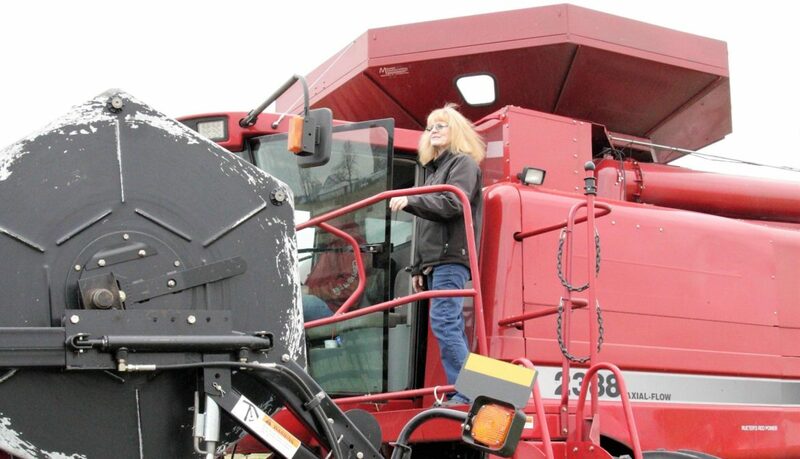 Griffieon has watched Ankeny creep closer to her farm for more than 20 years, but said she could see the direction things were headed as early as the mid-1980s. It began, she said, with the city passing comprehensive plans for urban growth. When she and her husband married in 1979, Ankeny was 3 miles from their house. Then, seemingly overnight, a subdivision sprang up out of ground that once grew corn and soybeans. “We came home from a county fair and there was a house out in the middle of a field. We knew it was going to happen, but that was the beginning of it. That was probably 10 years ago,” Griffieon said. Over time, more of Griffieon’s neighbors began to sell their land to developers, using the money, she said, to buy more land elsewhere. “People who trade their land will sell out for sprawl and they’ll buy next to an urban area like Fort Dodge that’ll be growing eventually so they can do it again,” Griffieon said. Ankeny, Iowa, continues to grow, taking over where farmland once stood. Photo taken Oct. 16, 2018. A state development law allows cities to annex areas where 20 percent or less of the land is owned by parties not willing to annex. The rule is designed to keep city borders smooth and avoid unincorporated islands in the middles of cities. 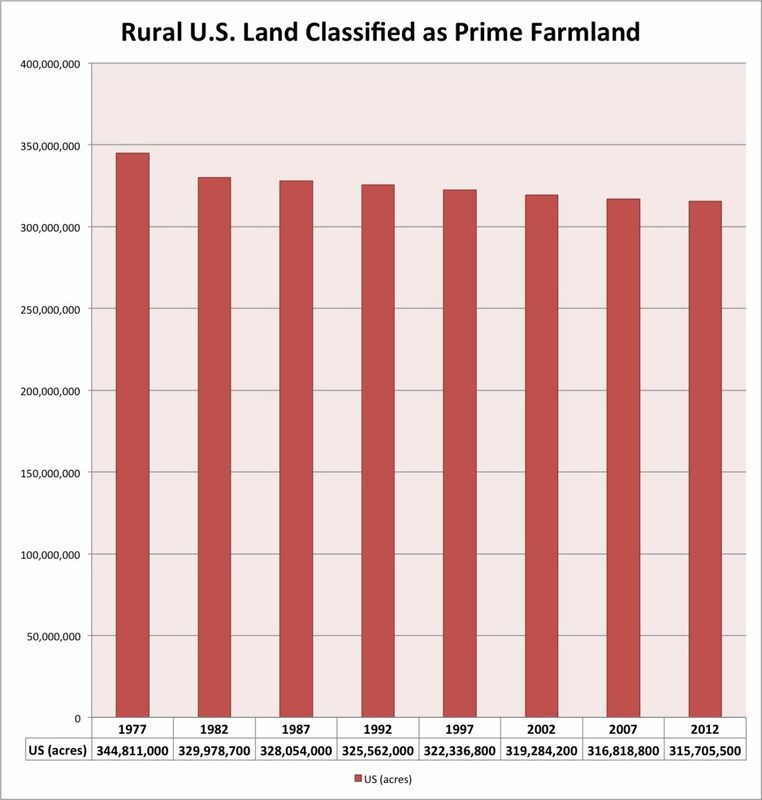 A paper written by Des Moines attorney Nicholas Cooper and published in the Drake Journal of Agricultural Law in 2004 details the historic patterns of how growing cities annex farmland in Iowa. Lorenz said all of Ankeny’s annexations so far have been voluntary, but the law calls 80-20 annexations voluntary. In an 80-20 annexation, a hearing is held before the state’s City Development Board, where the board must reach a supermajority of four of the five members to approve the annexation. In a voluntary annexation, pertinent landowners submit an application requesting annexation to the city that must be approved by the council. Involuntary annexations are not initiated the landowners, and less than 20 percent of the affected landowners are unwilling to annex. Involuntary annexations rarely are successful. 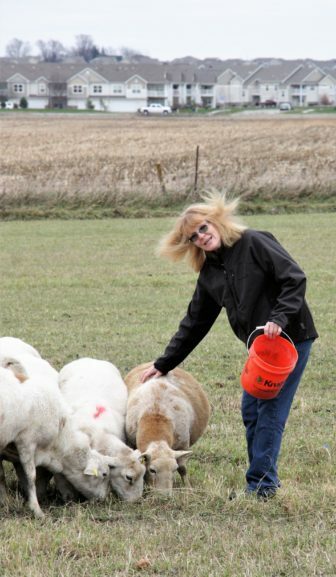 LaVon Griffieon tends sheep in one of the family’s smaller, remaining pastures. She also points out the field behind where they had corn, and how close housing in Ankeny has moved. Photo taken Nov. 7, 2018. If the Griffieons are closed off on three sides, Ankeny might be able to force them to annex. If given the chance, Lorenz said he didn’t know if the city would try to do so. Once the land is included in Ankeny’s comprehensive land use plan, the city can claim a stake in how it is used. With just cause or enough support, the city can exercise its powers of eminent domain and condemn the land for the public good. Lorenz said the comprehensive plans serve as more of a guideline than a strict blueprint, but even the suggestion of being overtaken by the city worries the Griffieons because they like their privacy, for more than one reason. Griffieon said both she and her husband have been hit by drunken drivers in the last 25 years. Another time, a drunken driver ran through high tensile fencing on the Griffieons’ farm, and cattle escaped, Griffieon said. Other problems, she said, having included a neighbor digging into her lawn for dirt to fill a low spot in his yard and someone cutting the Griffieons’ fence line. The family intentionally has told Polk County officials to keep the road to their house unpaved to deter drivers from coming their way, Griffieon said. As Ankeny inhabitants spread, the city requires public utilities when residential land is developed. Lorenz disagreed with Griffieon’s characterization of the situation. 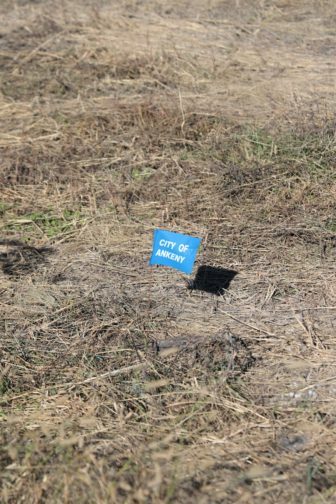 A small marker, noting where Ankeny is annexing land across the road from the Griffieon family farm just north of the city. Griffieon’s land is zoned low-density residential. So is the land around them, which the city zoned. “The city doesn’t grow by itself it grows by someone wanting to use the land. Typically, in Ankeny anyway, it’s mainly housing. 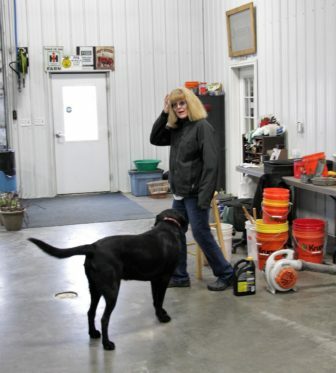 We do have significant commercial industrial, but we’re growing five to seven people a day,” Lorenz said. The city has a significant amount of multi-family housing, he said, but not everyone wants to live in an apartment complex or condominium. “We haven’t done any high-rises. We don’t dictate what type of building they (developers) are going to make,” Lorenz said. For now, Griffieon remains a vocal advocate for farmland preservation as Ankeny continues to grow. Asked if she’s received offers to sell her land, or what she would do if Ankeny comes for her property, Griffieon wouldn’t say. She said she’s seen other landowners lose land after speculating without using caution. This IowaWatch story was republished by The Courier (Waterloo-Cedar Falls, IA), The Gazette (Cedar Rapids, IA), Ames Tribune and the Midwest Center for Investigative Reporting under IowaWatch’s mission of sharing stories with media partners. These stories about the loss of high-grade cropland are very interesting and deserve to be read and considered. And losing high-grade cropland is a major legitimate concern. However, some of us are just as concerned, or even more concerned, about the loss to development of lower-grade cropland in the form of pastures and woodlands. Iowa has lost more of its original landscape than any other state. We are dead last, Number 50, at the bottom. What little original landscape we have left is mostly in the form of woodlands and prairie pastures, and those are exactly the areas that are often targeted for development, especially in counties that do have zoning and rules that provide some protection to high-grade farmland. Sometimes that high-grade farmland protection is poverty-based, however. In certain Iowa counties, one has to buy a certain minimum amount of high-grade farmland to be legally allowed to build a house on it. In a few counties, that minimum is 35 acres. So farmland protection depends on most people not having enough money to buy enough land to cause farmland to be lost to housing, rather than genuine legal protection. It’s certainly better than no farmland protection at all, but it’s not a great system. Some Iowa landowners, myself included, have provided permanent legal protection to small pieces of original tallgrass prairie and oak savanna. Those are now considered by researchers to be two of the most endangered ecosystems on earth. Meanwhile, natural areas continue to be lost to development across the state. I’ve seen a lot of that just in Central Iowa in the past forty years. Not long ago the town of Huxley annexed (via flagpole annexation, which is another land-use problem), a natural area, and did it so that land could be turned into classic rural-mansion sprawl. And largely because that natural area was a rolling fragile riparian area (which is why it wasn’t high-grade farmland), the development was written up by the Iowa DNR for soil and water problems. What we have in Iowa is a development problem, not just a farmland-loss problem. 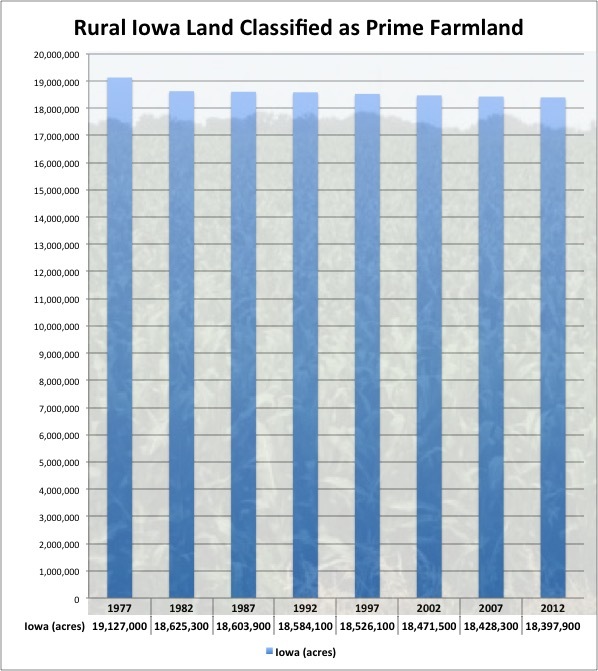 As long as most Iowa local governments meekly ask “how high?” when developers say “jump!”, and as long as Iowa’s state government shows almost no interest in sustainable land use or development, unlike more progressive states, we Iowans will continue to have multiple development problems here, of which farmland loss is only one.